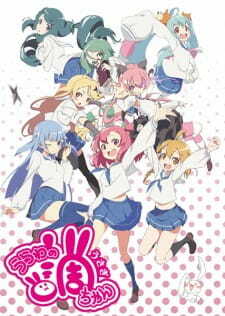 Sequel: Urawa no Usagi-chan Special, Musashino! There isn't much to say about this short anime. I think the art is nice. It's crisp, clear, and vibrant, but that's the only really memorable thing about it. Everything else is mediocre at best. I was hoping this would be an anime that personified places, but although I think that was supposed to be the plot, it was too subtle. Still, if you can waste a few minutes on a cute anime, this is probably a good one to watch. Anyone who spends much time on ANN or other anime/Japancentric sites will know that there is seemingly nothing Japan will not use cute high school girls to advertise. From alcohol to pearl diving, there doesn't seem to be anything that doesn't have a cartoon cute girl mascot attached to it anymore. Nor is it unusual for cities in Japan to recognize & attempt to exploit the potential tourist boost that comes from having places featured on TV. Many popular anime have spawned tours of the area they're set in; which more committed fans like to visit as a way to, I guess, get more involved in their favourite shows. This has become even more true in the last few years since changes to Japans tax laws has seen regions outside the Tokyo area competing for the attention of citizens who can now "donate" a portion of their income tax to a specific municipality. This brings brings us to Urawa no Usagi-chan (UU), a short series that was commissioned to promote the Urawa ward of Saitama city. Usagi-chan, our nominal main character, is a cute high school girl & member of the railway club, where she & the ensemble cast of other cute high school girls drink tea, eat cakes & generally do the things cute high school girls do in every cute girl SOL show ever made, ever. None of the characters are ones you can't tell everything about just be looking at their character design, & nothing they get up to would seem out of place in any other show or, indeed, any other place in Japan. Now there's nothing wrong with a simple, short SOL. Shows like Aiura, Encouragement of Climb & Inugami-san to Nekoyama-san are recent examples of shorts that pulled it off, & UU isn't terrible, although it's nothing memorable & indeed is so by the numbers as to be rather dull. But for a show that's supposed to be promoting Urawa, it does a pretty poor job of it. By the end of its twelve episodes we've inferred that there's a railway station (by virtue of there being a railway club), they have Juumangoku buns (a small & probably overpriced sweet, steamed bun), there's Yono Park, which apparently has roses & a cake shop, & some guy who likes surfing owns a tsukune-yaki (chicken kebab, basically) restaurant. The latter two are not places the cast visit, but come up in a quiz that I can only assume was included when the Urawa tourist board called up the producers & said "we're paying to to promote our ward, not draw pictures of little girls!" Oh, & there's Saitama ninja ramen noodles, but that might just have been part of a joke that went nowhere. Heck Boku no Imouto wa "Osaka Okan" did a better job of promoting Osaka than this does for Urawa, & that series could have been re-titled Osakan's Say the Stupidest Things. While the show makes no real effort to show off Urawa, it looks like the animation studio at least went for a visit. Many of the background images have the look of being location photos that have had an oil paint filter applied. There area also a couple instances of live film being used, such as when showing the aforementioned Yono Park. The art is really what you'd expect from a show of this type. The character designs are all fairly boilerplate, but serve the purpose of making each character recognizable. The animation is fairly minimal but for a slow paced show like this one that's to be expected. It's just a shame we don't really see any of note in Urawa depicted by it. To that end, it's hard to see the point of UU. Indeed, it feels like another example of a Japanese marketing team assuming that "moe" & "cute high school girls" are all you need to sell something, even if you barely bother to mention what that thing is or tie them together. Maybe that's true, but in this instance it's hard to see who this show is aimed at or what about Urawa it's trying to promote, apart from perhaps the fact that it exists. Good to know, I suppose.